When I was in grade school, the "big reward" for a job well done was always a class pizza party. My homeschooled kids have never experienced that, so we make up our own little family parties around fun events. 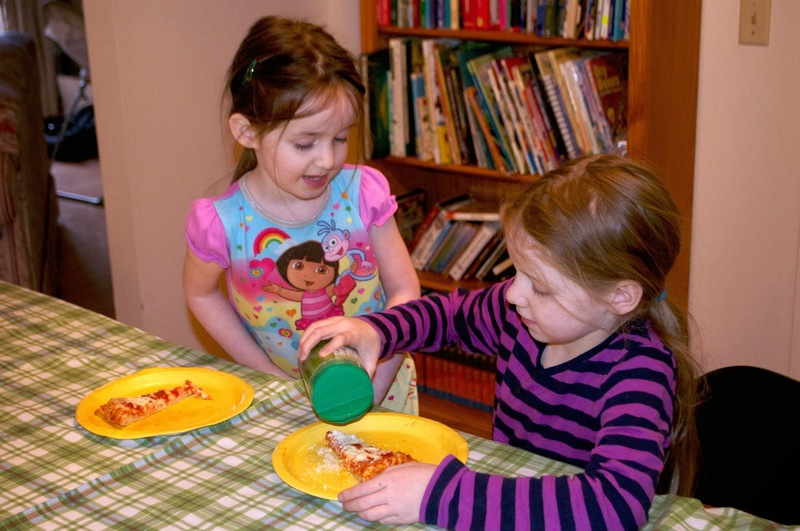 Saturday, we broke out our stash of DiGiorno pizzas and had a game time pizza party! 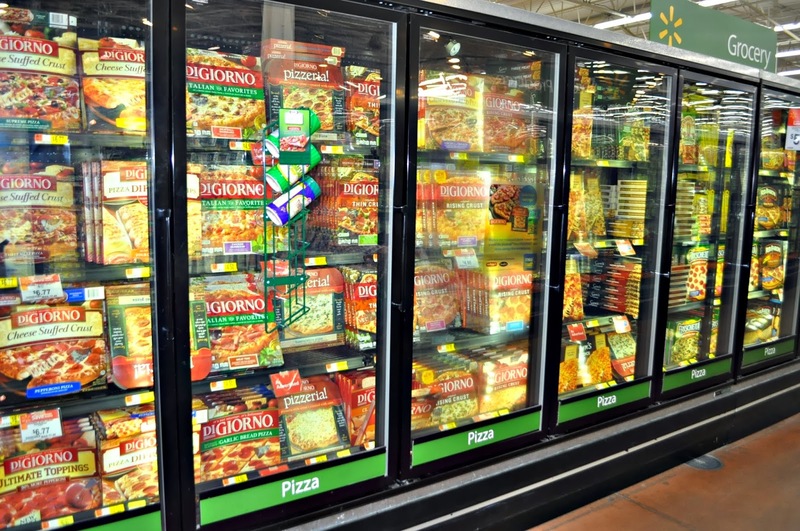 Earlier in the week, I had gone to Walmart to stock up on Nestle DiGiorno pizzas---selected varieties are on rollback for $4.50! 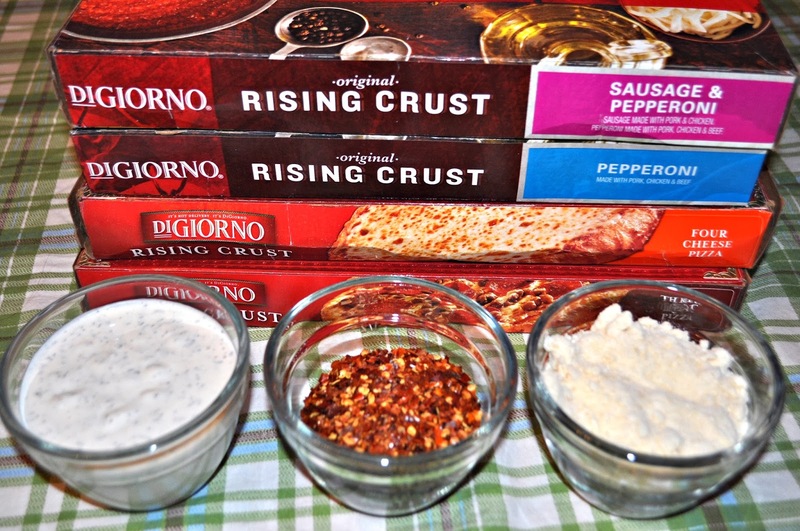 Lynzie and I picked out four Rising Crust varieties: Pepperoni, Sausage & Pepperoni, Three Meat, and Four Cheese. This is a popular brand at our house. It bakes up evenly and the generous amount of sauce, cheese, and toppings ensures everyone gets a hot and hearty piece! 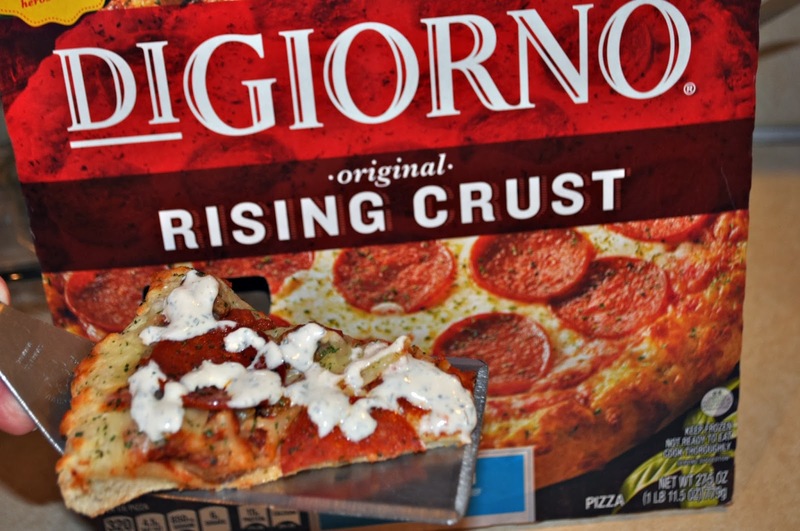 I remember when DiGiorno first came out with pizzas and their slogan, "It's not delivery, it's DiGiorno." I was a senior in high school and my sisters and I called them the "fancy pizzas". 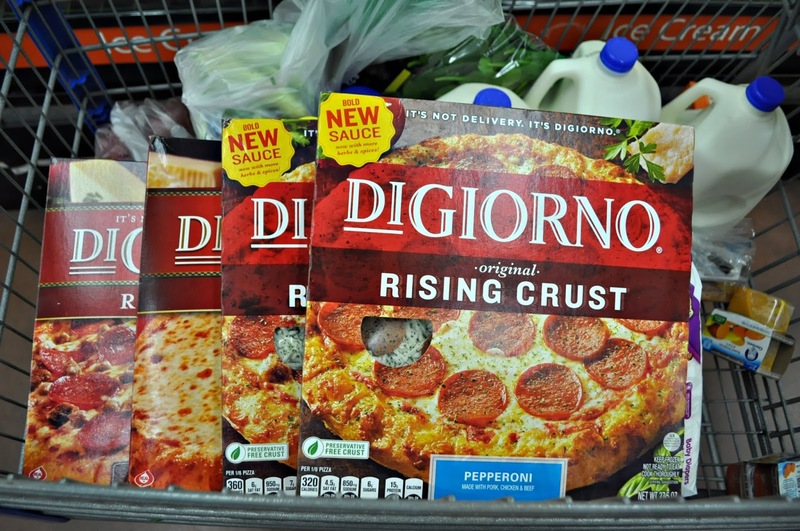 When Jamie and I married a year later, it was always a treat to buy a fancy DiGiorno pizza. We'd grab a couple of sodas and have a pizza and Yahtzee night. Now that there's 11 of us, four pizzas give us just about the right amount to fill everyone up! Now and then, I get a piece too! I know it's football season and, in everyone else's mind, that's the "big game". For me, though, the best game ever is hockey. Jamie says it's the Canadian heritage in me---I just think they've got the best fights! 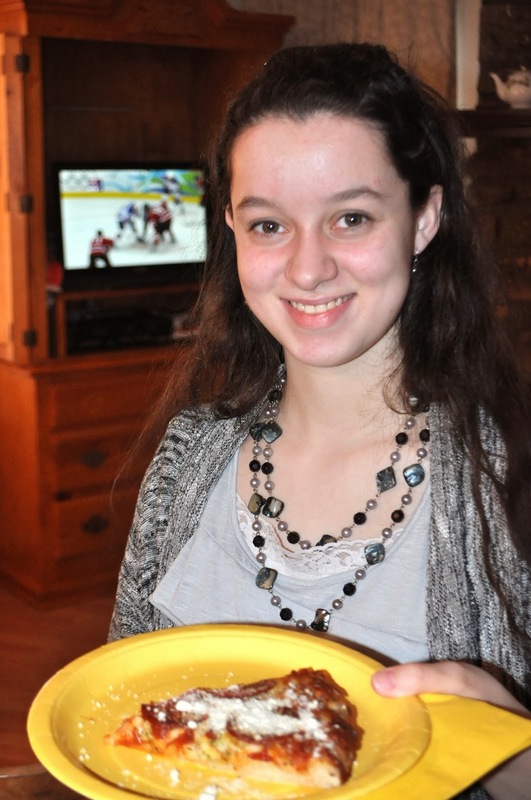 So, since I was the one who planned this pizza party, we got to go with my game! 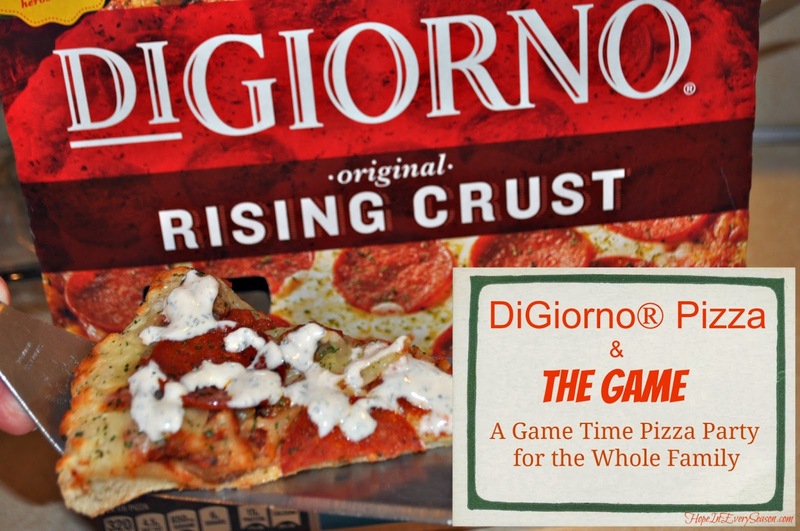 DiGiorno pizza is a great choice for a game day celebration. I love picking up good quality snacks that get me in and out of the kitchen fast so I don't miss a minute of the family fun. For this party, I set out a few extra toppings: homemade ranch dressing, red pepper flakes, and Parmesan cheese. These are the same kinds of toppings the delivery guy gives us when we order from our local pizza place. However, delivery can get very expensive for this family. Besides that, I think DiGiorno is a better quality pizza anyway---and you don't get all the extra grease that delivery pizza is notorious for having. 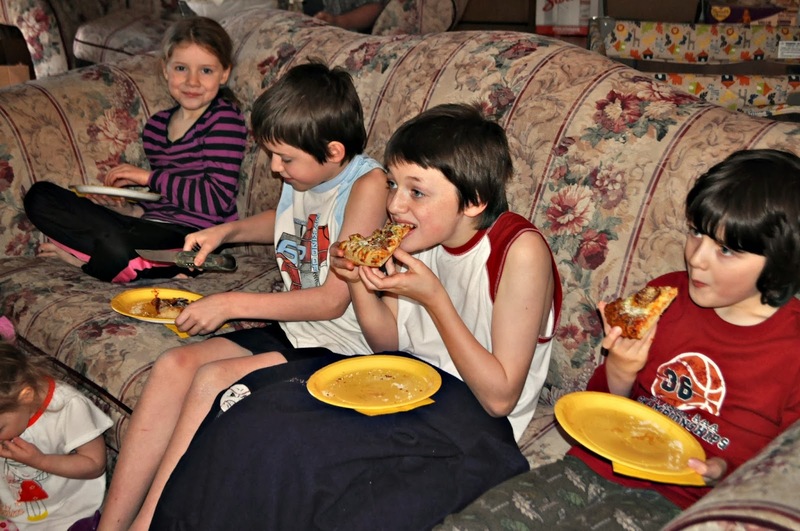 Other than the pizza, another big treat was that the kids were allowed to eat in the living room, on the furniture, and in front of the tv! That's pretty much unheard of around here---but I'm learning to lighten up a little! It's fun starting new traditions with our kids that are based on our own happy memories. Even though football has always been the reigning game in our home, I'm happy to say that, in one afternoon, I created a houseful of hockey fans! Shockingly, once all tummies were full and all focus was on the game, there were a couple of pieces of pizza left for me! Topped with my favorite addition, homemade ranch dressing, DiGiorno helped our family have a great Saturday game day pizza party! Great party. I wish The kids were closer to go to the Tri Cities with us...you all would love the Hockey games there. By the way, Elisha, that is a big knife! LOL!! Ha! I wondered if anyone would notice that knife! Once in grade school---I think it was with the TAG group---I got to go see a hockey game. I was hooked! It's definitely a meal that's sure to please everyone! Mmmmm.... we've just discovered Stuffed Crust Digiorno. Reminds me to pick some up later this week, it's been a while! 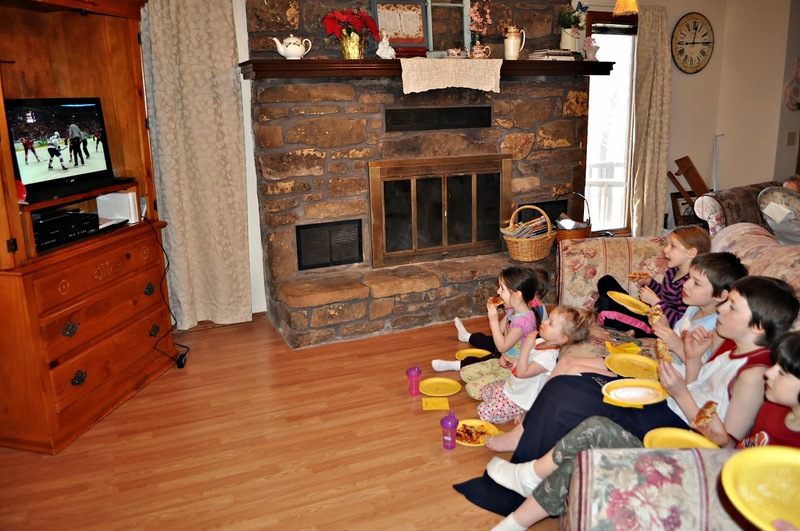 We eat in front of the TV for Movie Night almost every Friday. We love stuffed crust too! Since my kids love having string cheese and the crust reminds them of it, stuffed crust takes care of two special treats in one!